From July 1992: The fifth issue of the mostly-forgotten (it seems) British STAR TREK comic which slotted into the gap between MARVEL UK cancelling their NEXT GEN comic/ magazine and Titan stepping in with the launch of the their long-running mag (which did - initially - include some reprinted strip material). This incarnation reprinted US strips from DC's first run, slotting new adventures into the gaps between the movies post-Khan. 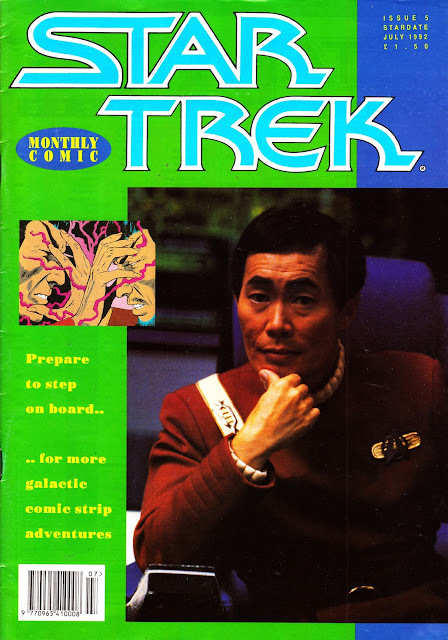 The same publisher was also responsible for the FINAL FRONTIER magazine (which started out as a vehicle for Trek-related STARLOG reprints before collapsing into a combination of not-supplied-by-the-studio stills and mail order adverts for merchandise) and a companion NEXT GENERATION comic (also reprinting DC material) which, from memory, collapsed after only a few issues despite the show having high profile slots on both terrestrial and satellite TV at the time. its very easy to overlook this title while researching trek magazines, one that ' fell between the cracks ' so to speak. which makes it ideal material for this blog.